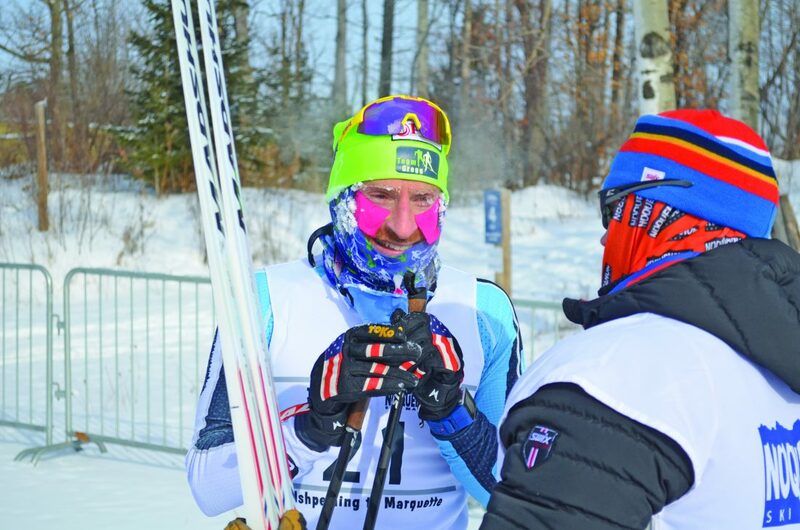 MARQUETTE — Sub-zero temperatures didn’t stop the 21st edition of the annual Noquemanon Ski Marathon from taking place Saturday morning. More than 800 skiers took to the fast but frigid course across 11 events, with the 50-kilometer races working out to more than 31 miles of trails from Al Quaal Recreation Area in Ishpeming to the logyard along County Road 550 in Marquette for the finish. 2004 Olympian Brian Gregg, 34, of Minneapolis was the first to cross the line in the 50K classic event, finishing with a time of 2 hours, 37 minutes and 32 seconds in his first Noque attempt. Gregg finished more than nine minutes ahead of the runner-up, which was claimed by Tyler Kobilarcsik of Chanhassen, Minnesota. Kobilarcsik clocked in at 2:46:50. Gregg said he entered the race thanks to advice from his wife Caitlin, who was the first women’s finisher in last year’s 50K classic. Caitlin was unable to attend this year’s race for good reason, as the Greggs are expecting their first child next week. Brian Gregg will use the $1,000 cash prize to help with costs for the couple’s newborn son and hopes he can come along next year as well. “Hopefully we can bring the whole family next year,” he said. In the women’s division of the 50K classic, it was a familiar face crossing the line in first place for Northern Michigan University fans. That’s because the winner was recent NMU graduate Vivian Hett of Burnsville, Minnesota. Hett, who graduated in May, was a four-year skiing and cross-country athlete for the Wildcats and two-time NCAA All-American skier. It was the 22-year-old’s first Noque as well as she finished in 3:09:51 and 22nd overall. “It was awesome and this is my first 50K,” Hett said. “It was really fun and enjoyable…. I’m just kind of working back into skiing and trying out the long races. “A lot of it was mentally hard. Just knowing when I got to 30K that I still had 20K more to go. It’s tiring, but skiers are tough and we can handle it. Hett also said it was nice to come back to Marquette for the first time in eight months. Hett also received a $1,000 cash prize for being the top female finisher. Andy Liebner of Cheboygan claiming the 50K freestyle crown for the second year in a row. Liebner, also an NMU alumnus, finished in 2:39:43, 45 seconds ahead of second-place finisher Zach Varty of Elk River, Minnesota. Liebner said it took some teamwork with his competitors to get through the challenging course and frigid temperatures, which hovered around 6-below-zero throughout the morning. “It was an amazing feeling,” he said. “It was a good time. It was a tight pack at the beginning, we all worked through the cold together and it was survival of the fittest and strongest out there. “Technique is a big thing. How you take corners, there are so many hills and corners. It’s a very technical course. The women’s 50K freestyle event was won by Mari Hardel of Duluth, Minnesota, who finished 38th overall in 3:13:25. Hardel said she didn’t mind the cold too much and had a much better year after an equipment failure in last year’s race. “The conditions were actually pretty fast in the downhills,” she said. “The uphills were very slow but overall with the weather reports, I was very nervous that it would be really cold but it wasn’t too bad. In her second Noque, Hardel said she experienced no issues and didn’t see too many others with problems either. A 24K half-marathon was also held with both classic and freestyle events. Marquette’s Andrew Stevens took first overall in that classic event in 1:19:21, while NMU junior cross-country athlete Hanna Torvi of St. Paul was seventh overall and first women’s finisher in 1:31:07. In the freestyle, it was Zachary Nelson of St. Paul, Minnesota, finishing in 1:08:55 for first place while Houghton’s Nikolai Huotari was second. Marquette’s Kyle Rambo rounded out the top five. Anna Engel of Rhinelander, Wisconsin, was the first female finisher in 1:25:04. Other events included the 50K touring class, 12K classic and freestyle races, 15-mile snowshoe and 1K and 3K adaptive skis.